TXG’s Compression Socks for Men (sometimes called Men’s Compression Stockings) promises to provide men with the comfortable stockings they need, without compromising on its graduated compression qualities. We’ve made our socks from a combination of fibers which including Supima Cotton, as we’ve found this fine count material is gentler on the skin in every way. Supima Cotton has excellent insulation properties, which means that in summer it will wick away moisture and keep your feet cool. In winter it will trap air between its fibres to keep you warm. As a result, your feet remain dry and odour free all year long. Whether you’re wearing them for a long-haul flight, for everyday use or exercise recovery, you’ll find that our compression socks exceed all your expectations by being low maintenance and high quality. Ready to experience the benefits of TXG Compression Stockings for Men, for yourself? 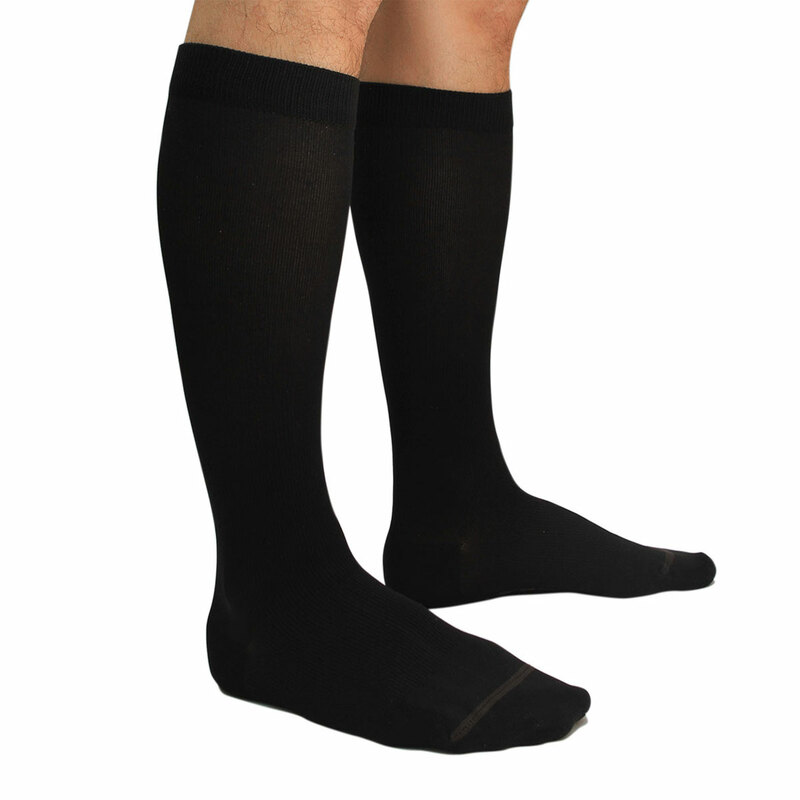 TXG’s Compression Stockings for Men are perfect for you if you’re looking for a stylish, luxurious and comfortable graduated compression sock which looks good, feels great and gives you all the benefits of graduated compression. Simply choose your size, compression level, colour and add to cart at the top of the page to have your compression stockings (socks) delivered to you anywhere in New Zealand with our free 7-day standard delivery, or you can upgrade to Express 2 to 3-day delivery for just $5.99. Rural deliveries take an additional 2 to 3 working days. Gentle Compression Level Compression Socks for Men – 10-15mmHg is the perfect compression level for compression-wear beginners and can be worn comfortably for long periods of time. A quick note to let you know that I reckon your compression socks are superb. I’ve made a few flights to the other side of the world and back since scoring a pair of these and think they’re great. Happy sock checking. I like the way the compression around the toes is less. They are comfortable and stylish. Doesn’t look like I’m wearing compression socks. I would recommend them because of the comfort. I have found the service provided by TXG Compression Socks to be excellent. The products are of a high standard and the communication from the staff have made the purchasing process easy and very client-friendly. I am extremely satisfied, the socks are very comfortable and I’d recommend them. Best customer services ever. Love it!! I had an injury to my legs from an accident causing swelling of lower legs, the socks are comfortable and lessened the swelling of the lower limbs. I am satisfied. I was looking for compression socks as we are flying to Europe shortly. Also as a Bank Consultant, I sit all day long and my legs were sometimes swollen by the end of the day. We are flying next week, so I didnt have a chance to wear them on a flight, but I did wear them to work and found that my legs were not swollen at the end of the day. I would and I already have recommended them. I have also purchase a pair for my Husband. We are finally back from our trip from England and Spain. The compression socks were the best of the best, my legs never felt better, never sweated and felt comfortable even after two 24 hour flights. I have a history of DVT’s and there was never a sign of a problem. I would throughly recommend these to anyone they are just fantastic. I bought the socks to stop my ankles swelling on long airflights. I havent worn them yet as not flying till August. They are very high quality. My TXG Socks keeps my leg swelling under control. Better then your competitors product and very high quality. Very good follow up post sales. Just to let you kno that I am absolutely delighted with the whole experience with TXG socks and would recommend them to anybody. The socks are wonderful and a perfect fit. Once again thank you very much. The brand recommended by the supplier I was sent to by the doctor were very expensive (made in Germany, sent to a supplier in London and then to NZ) Three pairs cost me $400.00. Having got them a year ago I have found them uncomfortable to wear with the pressure the toeless part puts on my toes!! Still I kept wearing them as I needed to reduce the swelling in my legs and feet. My wife then started searching the internet for alternatives and found you. We had been told that the only supplier was the one I was sent to. I have found them extremely comfortable and they have given my legs and feet the support they need. I have problems with my lymph system, which causes the swelling. I would absolutely recommend TXG !! In fact I saw my doctor this week and told him about TXG and he checked the website while I was there. They are comfortable and an affordable price. Your service and follow up is great. Very prompt delivery and very high quality socks. I havent tried the compression socks yet, I bought them for a trip to Hong Kong at the end of July. I can’t rate the socks yet, but I thought that your website was very good, and the Customer Service very good as well – it’s rare to have a purchase followed up. Many Thanks, very good service my socks arrived almost before you sent them! I have Varicose Veins, left leg only following farm bike accident. Without a compression sock, left foot becomes numb (pins and needles) towards end of the day. I would recommend them because they are cheaper then previous brands of socks I purchased from a chemist shop, and work as well, and seem like same or better. Quite happy with your service. High quality socks. The socks have dutifully arrived in good condition. 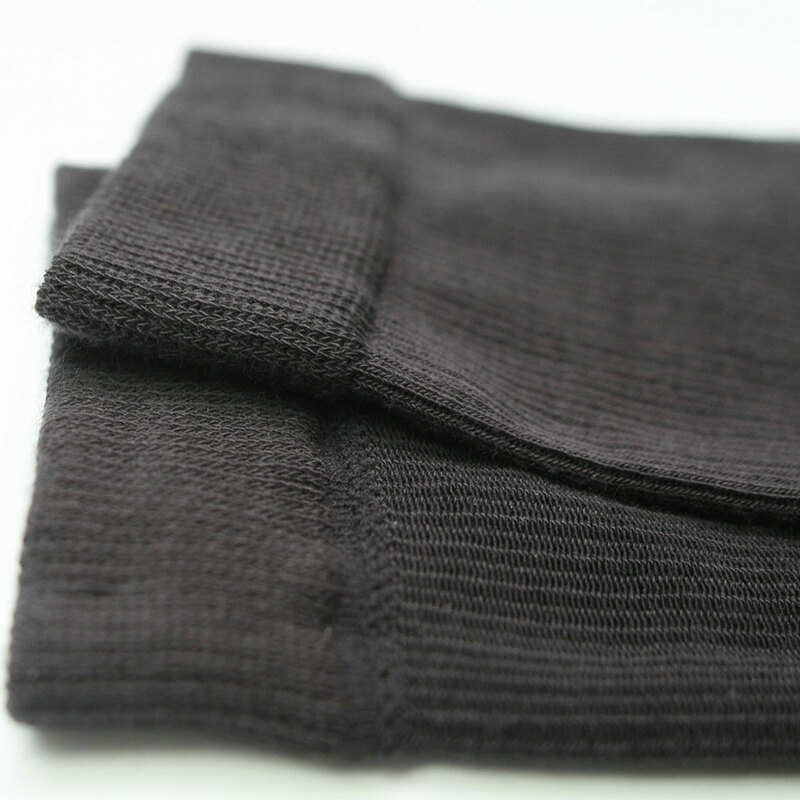 The black comfort socks are a large as ordered and a perfect fit. 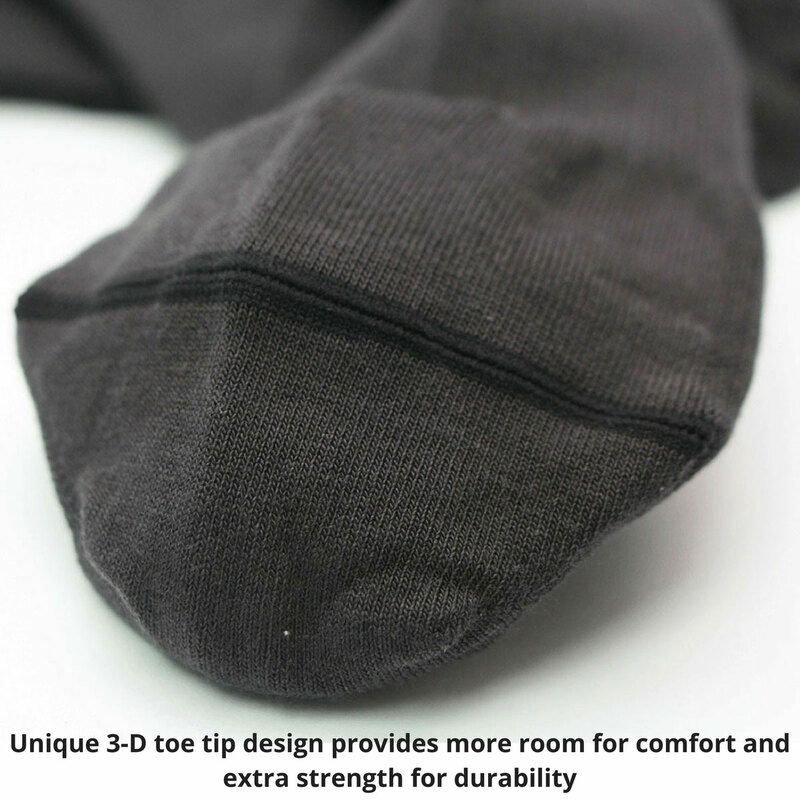 The sole is smooth without the ridges that plague so many of your competitors products. Great to wear. For whatever reason I’ve got soft as feet and by the end of a day standing and walking those ridges become uncomfortable. Not the TXG Socks though comfy all day. Thanks for the personal style messaging and the quality of the product. My compression socks arrived early this morning and what a pleasure it was for me to receive all your information and especially your personalised notes. The product was beautifully presented. Most exceptional and excellent service. I am trying out the socks today and so far they seem to be helping. so thank you and I will be in touch with you again soon. I had no idea what type of compression socks to get, your website made it easy to choose the right socks and the quality is great. 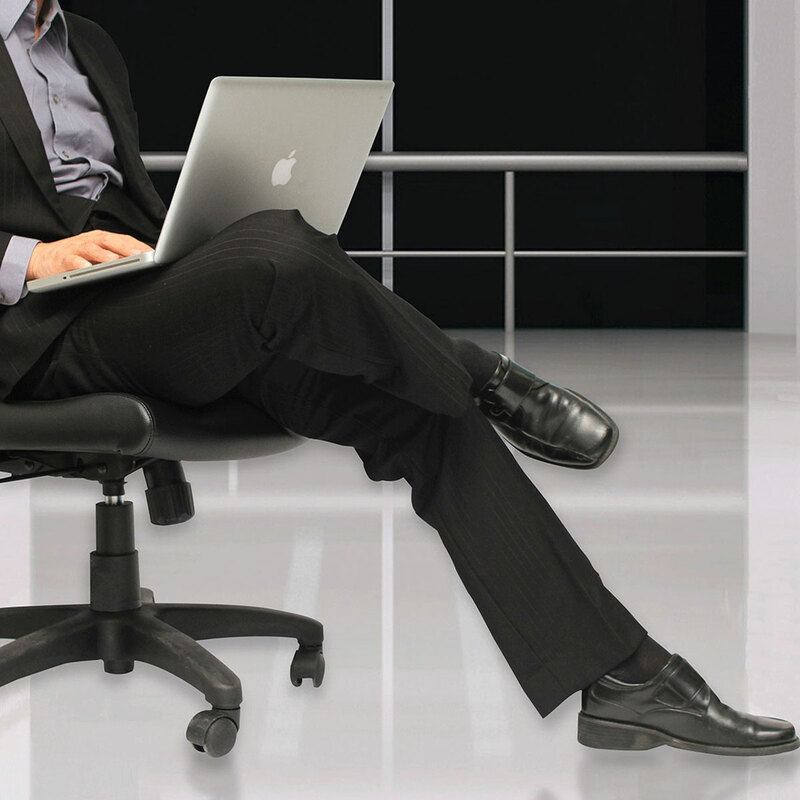 My legs feel refreshed even when sitting for long periods (at work or on the plane) and don’t go dead. I would recommend them – great quality – excellent customer service and informed guidance on what socks to purchase. Even though I didn’t respond to the follow up emails it made me feel that you care and love what you do. i think the socks are great and it made me feel that if there was an issue I have no doubt you guys would assist wherever possible. I am wearing my socks every day, they are giving me excess comfort. Unfortunately I have very swollen legs and ankles from Campylobacter and the compression socks are a god send. My socks have arrived and I am pleased to say I wore them for about 4 hours while doing some heavy lifting of some big tree rings for firewood, just to see how they felt and I’m pleased to say they were much more cofmrotable than I expected, so very happy so far. My socks have arrived and in good order. I was looking for quality and something NZ. I would recommend them as I have no major issues with my merino socks – they look good – feel great – and do what they are supposed to do. Great service – great presentation of socks and great people skills. I have just received my pair of compression socks from you. I was totally impressed by the manner in which the socks were packaged and the way that you went out of your way to outline the way to put them on/washing etc. Even the little purple bow and gift was thoughtful. The way you presented everything was totally professional and although I only spent $55 the way everything was presented could have looked like I had spent $$$$’s with you. Thanks again. Compression socks are great thanks. Also the way you package it and send the little parcel is just amazing. You do such a lot to make people feel good. Thanks heaps. The compression socks arrived. They fit well and I appreciated your service very much. Thank you again and will order from you again if I continue to need them. These are the best travel socks I have had. Been on over six long haul trips in the last 8 months and each time I have not had any fatigue or swelling of my feet. They are very comfortable to wear, the compression is firm but not painful and I will certainly recommend them as a top class product. I have long distance travel of 17 hours on one plane flight coming up. I have yet to wear my compression socks on the flight – I have tried them out around home. 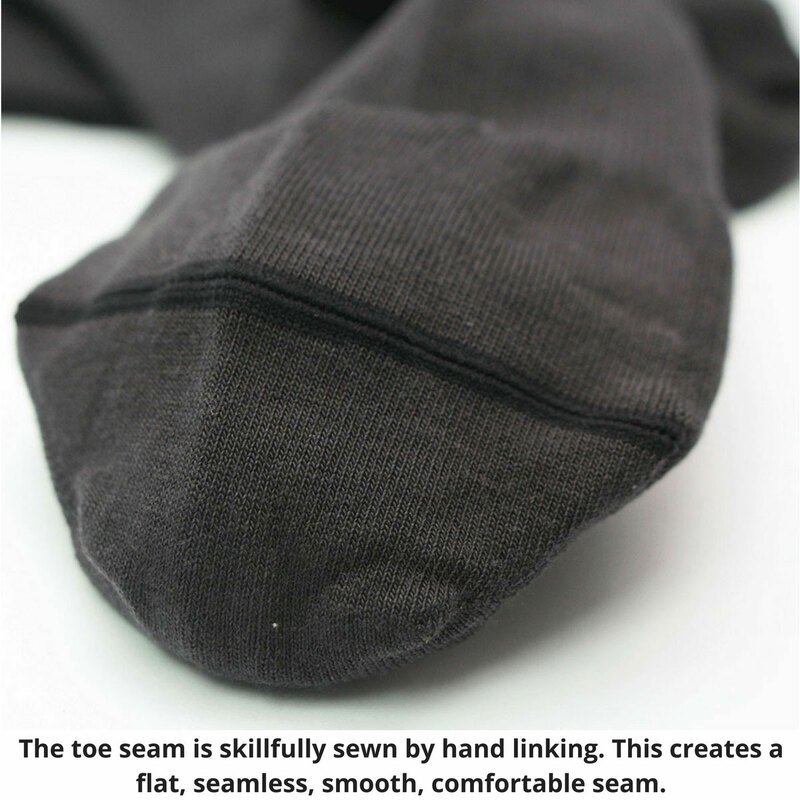 The ability to know the correct measurements for the correct sock is very helpful. I would recommend them as they are a specific to fit item not a general hit or miss on correct size. I have varicose veins the benefit I found from wearing my TXG compression socks is that I had no discomfort or pulsing feeling in my legs. They are expensive but appear to be of a high quality – assuming they will last for more than a few months. My TXG compression socks arrived within 24 hours and I am wearing them. They are very comfortable – fit perfectly and look good. I am so pleased with my TXG socks and impressed with your TXG customer service – you can expect me to be a regular TXG compression socks customer in the future. The socks prevented swelling during my overseas travel. I would recommend them for sure. Awesome great service. My husband had comfortable legs and no swelling at the end of his 24 hours of flight time. I wouldn’t hesitate to recommend these comfort mens compression socks. Far better quality than the only brand available locally for the same price. Excellent to get a breathable travel sock for better comfort. Fantastic service. Socks – packaging and service all top notch. My socks have arrived safely and have been very good to wear. I was looking for firm but comfortable fitting compression socks from the base of the ankle to just under the knee. I found the comfort mens socks provided good-ish support for a 33 hour (door to door) set of plane trips within 2 days this week – inlcuding 23 hours in planes. I would recommend them because for my lower leg the fitting was OK – better than others I have tried (brand names forgotten). I was disappointed that the hold of the sock wasn’t firmer (but of course without being throttling)Your Customer service is the best – don’t change it – fast – correct – kept me up to date 5 out of 5. Socks I would rate 3-3.5 out of 5 – all other brands I have tried I would not hesitate to rate 1 out of 5. Your website provides great information and guidance on how to select the right socks. I will be wearing my comfort mens compression socks on a long haul flight to Europe soon. I would recommend TXG socks because of the great advice provided on choosing the right type of socks for the individual. High quality socks and great customer service. Soooooooo cute 🙂 I absolutely love your marketing – my socks have just arrived. Beautifully gift wrapped and lovely words on your cards. Thanks heaps, I’m so impressed with your service. Will definitely be shopping with you again. I would recommend them. Easy website to use and fast delivery only a few days to get them before my husband had to travel by plane and they got here in time. Also good variety of socks and my husband said they were very comfy and he had less swelling of his legs and ankles. Will definitely be buying more. Thank you for your wonderful service. Socks received and will be tried out on long flight in May. Great communications. My problem was aches and pains (standing while working), varicose veins and I also suffer from diabetes. After wearing my socks I found pain relief, no tiredness, no aches, no pain and reduced swelling, my legs feel much better and also look better. I would recommend TXG socks because of the excellent quality, good support and they assist blood flow. Keep up the good work, you are doing a great job, excellent service!! love your friendliness and helpfulness and good service. You really know how to sock it to them!! The socks are great heading for the hills like never before. Hi Heather, I have been searching for compression socks for a week or so and your add popped up on a nzherald site so I went ahead and purchased. Very impressed with what I received, a lot of information and a hand written note from you. We went for a walk last night about 3kms and I found them to be very good. We are off to Vancouver next Friday on a 13 hour flight and I get swollen ankles even on a 3 hour trip to Sydney so that is the reason I purchased these.Your service is amazing! Thank you so much. I have to say the socks are perfect and I’m thinking we will recommend your company on our website for all clients travelling with us. The socks fitted me perfectly and Ali as well. After many long hours flying our legs were not tried and not swollen and felt fine. I actually forgot to put my socks in my cabin bag on a flight to Kenya … had to buy socks in Nice airport – YUK what a horrible experience – I’m thinking I need a second pair to be able to change after and on long flights. A big thankyou for a product that is awesome!!! Thanks so much for the recent delivery of my flight sox, also for the online version of your “Ultimate Guide to a Comfortable Flight”. Your personal service is exemplary and quirky! I don’t know how you manage to do it. Best wishes and thanks for the sox ( I might even consider another pair for recreation!) Your service is unparalleled. I am a very happy customer with my purchase from last year. Have your contact details on my desk, so will be in touch when required. I like the ease of fitting my TXG socks (with excellent advice) the constant aching in my ankles is eradicated. I would definitely recommend TXg socks and Heather’s commentaries are a great joy. I can’t think of anything you could do to improve. Thank you for dispatching the pair of stockings which I received yesterday morning. I am fully satisfied with your product and will be ordering some more in the near future. The quality is excellent and I have no complaints to voice about it and will recommend them to my friends. My comfort men’s compression socks are quality, comfortable and warm and provide a sense of wellbeing knowing that they are doing my legs good – called Prevention. I recommend TXG as number 1 because of your excellnet customer attention and customer service. There is nothing you could do to improve, your service is outstanding. Will be wearing your socks with pride when I fly out on 23rd. I’m really pleased with the compression socks I bought through TXG – I’ve tested them out for my “big” overseas trip and am impressed at how comfy they are. What great service, speedy delivery and follow up your company provides. 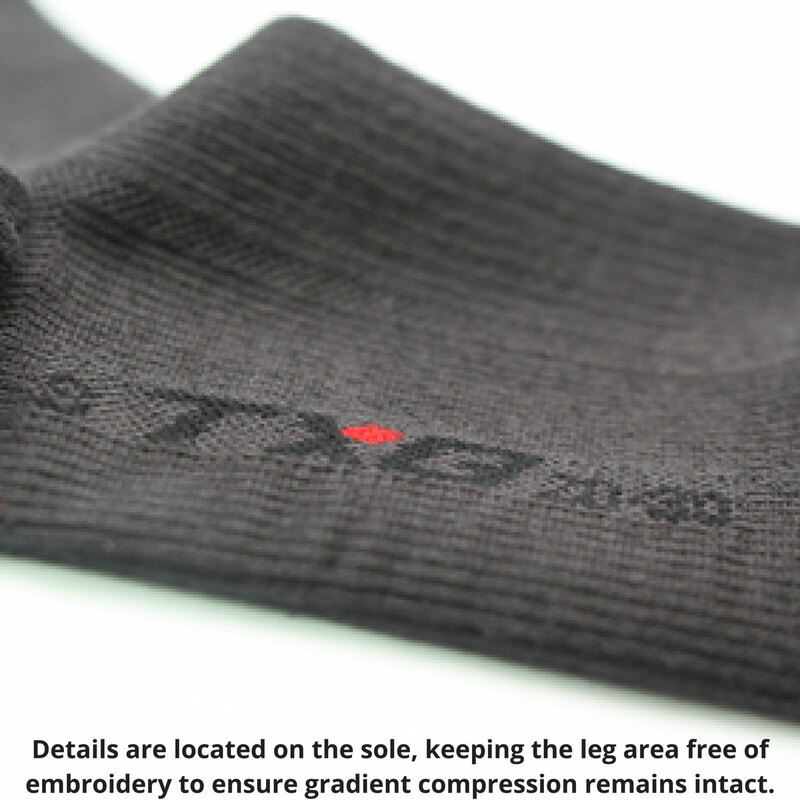 I’ll absolutely recommend TXG to my friends and workmates for those looking for or talking about compression wear. Great job. Thank you for sending my socks and for the lovely gift enclosed which will come in very handy. The socks are fantastic and I love the quality and secondly it does not run down and stay firm on the legs when I go for my walks in the mornings. I will continue purchasing more of the socks in the future. The quality of the socks is excellent and I will recommend it to my friends and neighbours. Felt great within an hour of putting the socks on, I would like to order a pair for my wife. Well what can be said. suffering swelling and painful feet a trip to the doctor resulted in a packet of Panadol. I noticed that by putting pressure on the top of my foot relieved the pain, interesting I thought. After some research I found out about compression socks and was surprised to learn that one of the best was made right here in NZ. OK so I thought lets give them a try so I purchased a pair and eagerly awaited their arrival. At this point the discomfort was quite intense the swelling had gone down and the pain had increased I could not sit in a normal posture but had to keep my legs and feet elevated. The socks arrived and I rapidly ripped open the package and put them on the relief was instant and truly amazing, within a few days I ordered another pair and now wear these wonderful creations from morning to night. I am also seeing a slow but definite improvement in the condition of my feet. Thanks to Heather and the crew, I hope when the bells ring and the party starts at TXG u understand what your socks can do and the way you are helping all those in trouble and pain. My husband loves his TXG socks, the swelling in his legs has gone down considerably and we will be ordering more. I think that my Comfort socks are fantastic and I am very happy and will continue to order some more in the near future. The quality of the socks is superb, thanks once again. Since wearing my TXG socks my legs don’t get as tired, they feel nice and comfortable to wear and they keep the swelling in my legs to a minimum. Our TXG socks were great, they worked very well for both of us while on our trip. I was worried about swelling in my legs, but had no problems at all. My socks are beautiful, I wore them on a flight to Brisbane and they were also great to wearwhen I was walking, theywere so comfortable that I would like to order 2 more pairs. I find TXG a great company to deal with, great communication and prompt delivery. The packaging was superb. I would have no hesitation in recommending your company and the great product. Thank you for the compression stockings and gifts received a few days back. I really appreciate your prompt service. I am fully satisfied with the stockings and will be ordering some more in future. Thanks once again. The soxREALLY were very comfortable to wear and I DID feel the benefit after both flights. I wish you guys all the very best – you do deserve success simply based on your approach to the customer – well done. I have received the pair of socks and have tried it and am fully satisfied. They are nice and firm on the legs and comfortable and do not ride down my legs as my previous purchased other brand of socks did. In future will continue to order some more. thank you for your prompt replies. I received the pair of TXG socks I ordered and have been enjoying wearing them and I am pleased with the way they seem to be helping keep my legs from swelling. They feel comfortable. I intend to place an order for a second pair soon. Your prompt service was appreciated.